Places like Austin Materials Marketplace and Habitat for Humanity ReStore are perfect sources for repurposing something we no longer use. Sites like these exist everywhere, so give those a browse before tossing anything. One man’s trash is another man’s treasure. The recycling bin is for waste that doesn’t quite fit in with the cool organics crowd, but still has potential. This group is made of the usual suspects that come to mind when someone mentions “recycling:” metals, plastics, glass, and paper. Of course, all of those categories have exceptions because it could never be that easy. What is easy is logging on to your local waste management/recycling center’s website to see exactly which recyclables they’ll accept. Some places will even accept batteries and electronics, so last month’s smartphone could turn into next month’s model. It’s important to check with your local recycling facilities before sorting because each center is a special snowflake that approves different materials. Here in Austin, Balcones Resources will take resources like brightly colored paper and shrink wrap, which aren’t widely accepted. Austin Resource Recovery also provides a foolproof recycling guide that details exactly what and how to sort your waste for their bins. If you’re not in Austin, we’re sure your city is great too, and has similar resources available. This is what you were waiting for, right? The series is called “Organics Made Simple,” isn’t it? This bin is for the materials that naturally break down. No, this does not include your car or your emotionally needy friend. 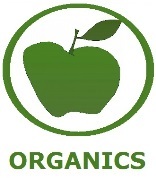 An easy way to remember organics is “if it grows, it goes.” Anything that was once alive is usually compostable. We’re talking about food remains (like eggshells and banana peels,) paper, brush and grass clippings, leaves, and other organic materials that decompose at a reasonable rate. 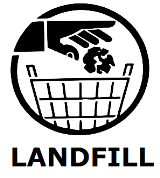 Items you may be surprised to find are compostable: pet/human hair and food-soiled cardboard/paper products. That’s right, your weekly pizza box (we all have one) belongs in the compost pile, not the recycling bin. If you’re still confused, composting businesses in your area (like Organics “By Gosh!”) are ready and willing to field your questions. We haven’t completely erased the need for the landfill, yet. 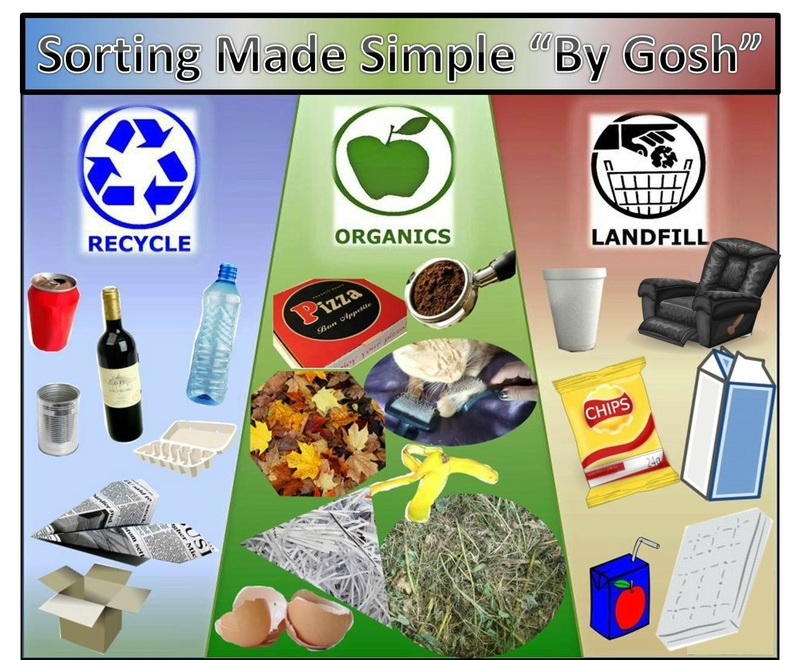 Waste like chip bags (check your local center,) styrofoam, and flimsy plastic packaging all belong in the landfill bin. Mattresses and most furniture generally aren’t recyclable either, but these items can be donated to charity (or any college student/recent grad) if they are still in usable condition. Many places also offer bulk recycling days specifically for furniture. Some items that you might think are recyclable but aren’t: plastic or wax coated cartons (like juice boxes and most milk/milk alternatives) and brightly colored paper. Have you ever tried to un-laminate a piece of paper? It’s the same way with cartons and coating. You can’t recycle the paper packaging because that coating isn’t going anywhere. The dyes in brightly colored paper make recycling difficult since the “red sock in the white load of laundry” conundrum also applies here. There is a time and place for pink paper, but that time and place isn’t always and everywhere. An alternative would be to use pastel or lighter colors because those are much easier to recycle. 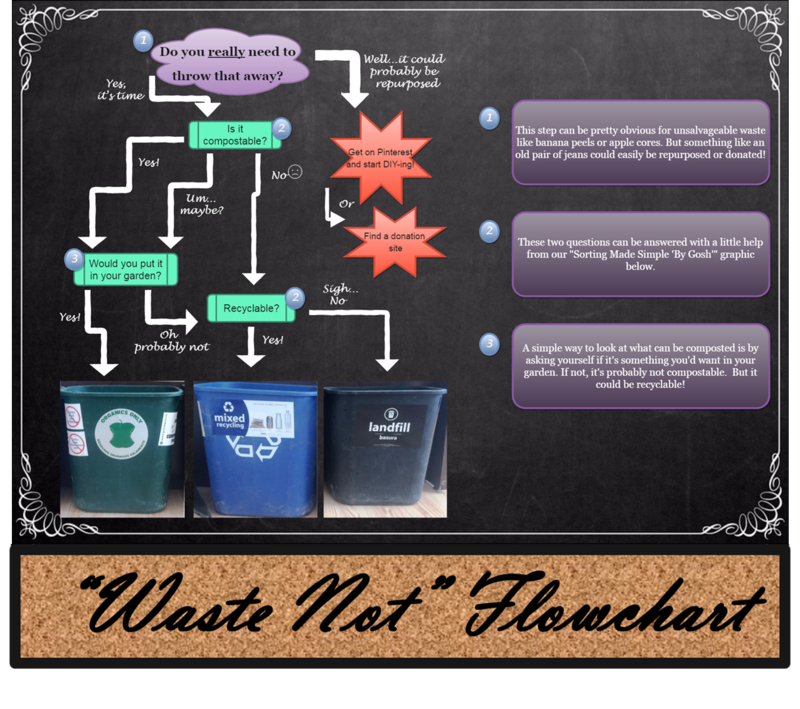 The best way to make waste sorting simple is to avoid creating waste altogether. Every city and recycling facility is different when it comes to recycling restrictions, so be sure to double check! Hazardous/chemical waste has its own recycling. It doesn’t belong in these bins. Check to see if there are composting locations in your city to help you or your business with your organics recycling needs. They (we) are happy to help!